I don’t know about you, but each time I buy fresh herbs, I end up wasting some because I don’t know what to do with so much. This is often the case with mint. Every year, we rent a cabin along with some dietitian friends and mojitos are always on the menu! This time once again, half a packet of fresh mint leaves travelled right back with me to Montreal after the trip. What you should know firstly is that mint can be dried or frozen. So I decided to freeze most of what was left for later use. I did however remember a story I had read in the book The Drunken Botanist, a bible of the plants used for creating alcohol. 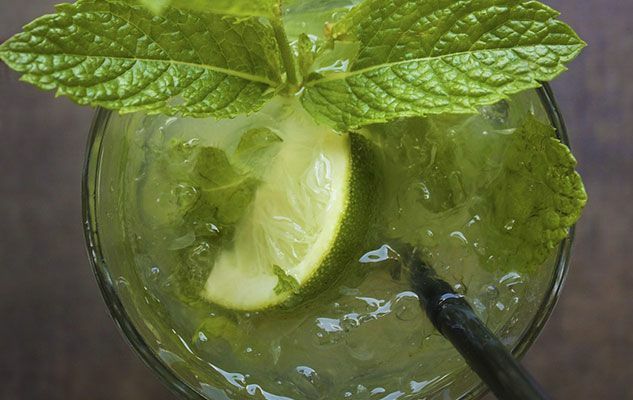 In fact, mojito mint (Mentha x villosa) originated in Cuba and has only hit the market quite recently. This is because a United States embargo made it impossible to get any earlier. So how comes this plant can be found everywhere? It is thanks to tourists, who removed branches of mint from thei cocktails, carried them back in their luggage and planted them once they got home. This says a lot about how strong the plant is! So I also decided to replicate this experience, but in a more legal manner. Given below is a step-by-step guide to convert your leftover mojito mint into an urban micro-garden. Fresh herbs are often found in container. I decided to use it again to provide a greenhouse to my shoots. First of all, fill the pot with soil. Then take 2-3 mint branches and strip off all but the two most recent leaves. Bury the branches inside the soil, water slightly so as not to drown them, then close the lid and wait. Your mint, fresh out of the refrigerator, will gently rouse itself from slumber and start to grow again.